Recently, I seem to have been on a spree of collecting miniature, small-wheeled bicycles. Possible because I miss Amy’s fantastic small bicycle-like creations, and also because I enjoy exploring the design space of strange personal transportation implements. I happened upon these… things… because of the wonders of eBay and Craigslist. They share common traits of being near impossible to ride, requiring unconventional posture because of the compromise between drivetrain and bicycle geometry, and fold to various degrees. 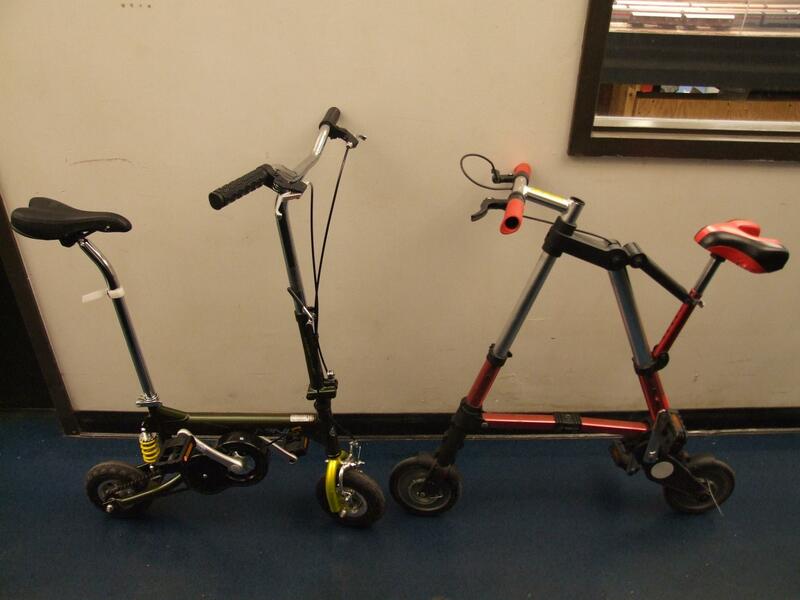 On the right is the “A-bike”, the more senior of the two finds and nicknamed “Derpybike”, and on the left is the “Kent Mini 8″ which naturally received the complementary moniker Herpybike. Granted, the A-bike is actually a shady Chinese version of the real thing, which I presume works better, but has even smaller wheels. It packs down very small, unlike the Kent which doesn’t really fold so much as allow you to bend the handlebars back over the rest of the frame a little. Despite being half mystery plastic (I really doubt it is carbon fiber filled nylon), I actually like the Shady A-Bike better and have actually risked life and limb riding it around campus several times. It has hard 8″ polyurethane wheels, is shaky and rattly, and the constant fear of the plastic frame components snapping at the next sidewalk crack lingers over you. The Kent Mini has a slight “foot forward” posture that feels wrong for a bike-like vehicle, and it is geared very slow – a reasonable bike pedaling rate is translated to barely as fast as jogging. But, it is actually made of steel tubing and uses conventional 200 x 50 size pneumatic scooter wheels. It also has a humorous attempt at a rear suspension. There’s really no way to look remotely manly, or even serious, riding one of these things down the street. That’s probably why miniature personal vehicles are rarely commercially viable – the cold, judgmental stares of your fellow citizens tends to damp any enthusiasm you might have had. More properly, maybe the term shouldn’t be miniature vehicles, but caricature vehicles. Come on, those two things both look like clown bikes, so you naturally look like an assclown while riding one. The real question is, which one should receive infinite horsepower? i vote for the A-bike copy. Re-engineer the plastic parts in aluminum or something. But its a way better design to begin with. Theme created by miloIIIIVII | WordPress | Entries (RSS) | Comments (RSS) | 32 queries. 0.612 seconds.